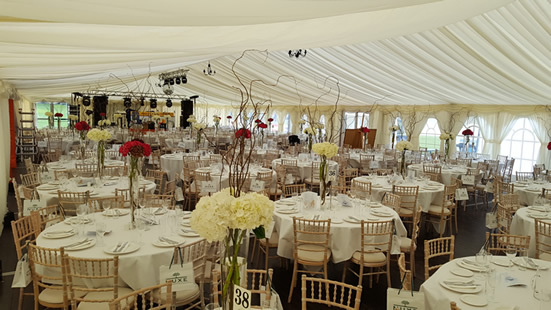 Marquee Solutions event hire aims to provide you with the perfect venue for your special event, be it a private family function, a birthday celebration or a marquee wedding reception in your own home. 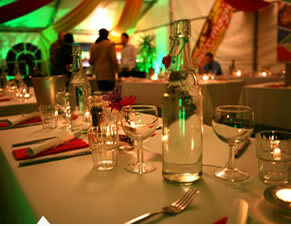 Marquee Solutions the marquee hire and event management specialists will provide you with the perfect cover! 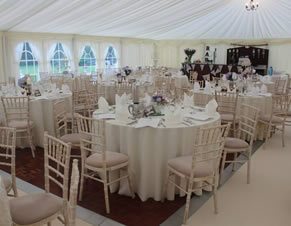 In very many ways, a marquee is the ideal venue for your wedding reception. You can have it when you want without booking years in advance, and where you want, such as a lakefront setting. Want to celebrate a birthday or throw a party for that special anniversary? 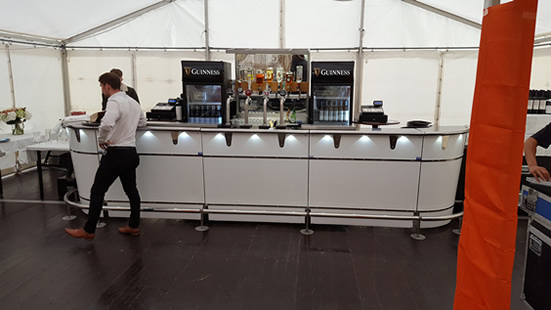 Marquee Solutions can make it a truly memorable occasion, maybe even in your own garden, right in the bosom of your family. Tired of the same old venues and locations year after year for your annual meeting, open day, or get-together? Why not make a change? Why not have your event where it suits your staff and clients? 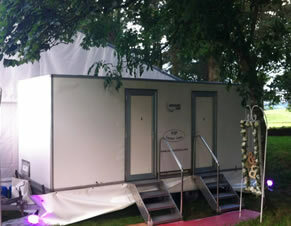 We have Mobile Luxury Toilet Units for hire. 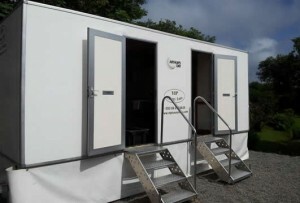 These are purpose built and quality finished full plumbed flush toilets, with separate Gents & Ladies. Gents has 3 urinals & 1 cubicle, while the Ladies has 3 cubicles. All accessories are optional extras and won’t be included in the first cost estimate unless specified before then. A 5m x 5m pagoda can be a charming and very useful accessory to your marquee, as a reception area/entrance to the marquee, or as a joiner to a building, etc. etc. (other sizes available). Why not get the ‘red-carpet’ treatment and avail of our carpets as an eye-catching and classy entrance to your marquee or pagoda? A dance floor is available should you like to have one. We have a stage which should suit anything up to a 6 piece band, or which can be used as a raised platform. A bar counter is available to which portable beer taps can be attached. Power generation for any or all your lighting and sound needs can be provided – just let us know what is it you want to do. 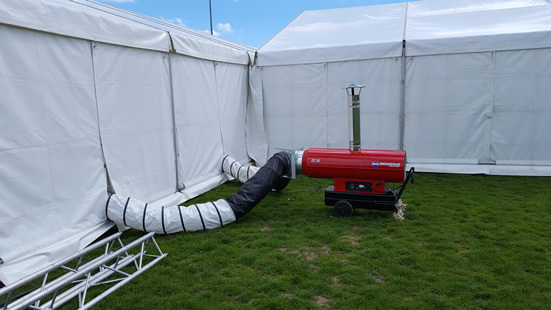 Space heating for the marquee is available and will be delivered, setup and tested before your event. We can provide chandelier lighting or rope lighting easily, or facilitate any other lighting effects you want. If you have a spectacular view at your setting, one wall, or more, of the marquee can be windows through which your view is enjoyable from inside the marquee. If you wish, we can provide an event manager for the duration of your event, to ensure all transitions go smoothly. Whether you’re having a corporate seminar, or full wedding breakfast, we can provide whatever furniture you need. Tables and chairs of various styles, and anything else you can think of. Just let us know what function you’re planning and we will go through all the options with you. Thank you all so very much for giving us a magical day. 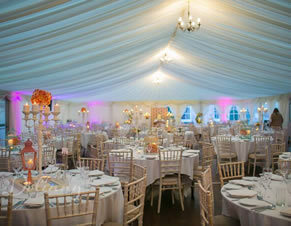 The marquee looked amazing and we were both absolutely thrilled with your professionalism. Enniscoe House - Co Mayo. Michael, Philip and everyone at Marquee Solutions! The marquee looked terrific – it really help set the perfect scene for our wedding. “We just wanted to drop you a quick email to say thank you so much for everything with the Marquee for our wedding. It was exactly what we hoped it would be. The crew were great and really worked hard”. “I also would like to thank everyone on your end for their professionalism and attention to detail. I must say you were all a pleasure to work with and we will certainly be requesting Noel on site for the next one. In addition all the sub vendors were very nice and easy to work with, truly was a smooth week. The Marquee looked amazing on the grounds and everyone complimented it. Take care for now and many thanks to you all!!”. My new wife and I would like to thank the team at Marquee Solutions for their hard work, advice and professionalism in providing their top-quality marquee for our wedding day. From the first minute that we made contact with Marquee Solutions we found their service to be of the highest quality. 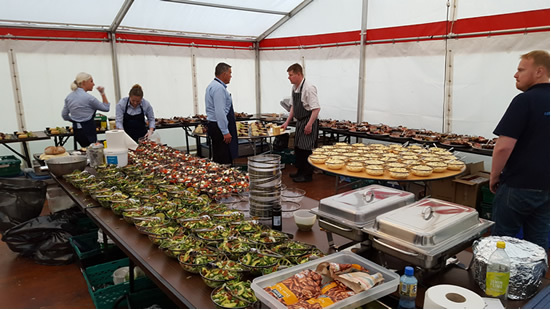 “For the last few years I have been holding wedding receptions on my own Premises at Errisbeg House in Roundstone, Connemara, Co Galway, Without any hesitation I would always recommend to my future clients to avail of the services of Philip and Michael Rowe “Marquee solutions”. © Copyright 2017 Marquee Solutions - marquee hire Mayo, Sligo, Galway, Donegal and more...| Website designed by Darkblue Design, Mayo, Ireland.